Replica of world famous Qin Dynasty Terracotta Warriors, also known as the 8th wonder of the world.Background:Chin She Huang, the first Emperor of China. He conquered and united China to become its First Emperor. He built the Great Wall and amassed great works of art. A megalomaniac, he sought the secret of immortality. 70,000 workers built his tomb filled with legendary treasures. His 3000 wives and concubines followed him to the grave.Over 6000 fantastic life-size clay warriors protected his tomb. The Famous Terracotta Army - one of the wonders of the ancient world. 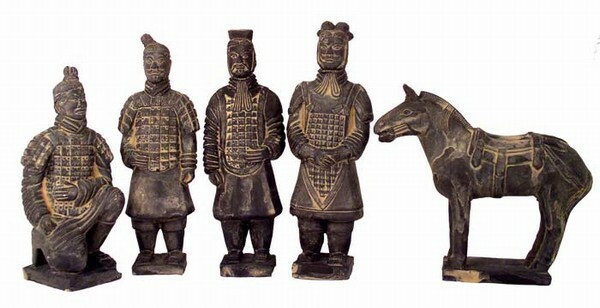 Size: Warriors L2" x H5" x D1" Horse L4" x H4" x D1.5"
Antique Reproduction Qin Dynasty Terra cotta Warrior Collectible Statuette Large 16"
Antique Reproduction Qin Dynasty Terra cotta Warrior Collectible Statuette Large 12"
Antique Reproduction Qin Dynasty Terra cotta Warrior Collectible Statuette Meddium 8.5"
Antique Reproduction Qin Dynasty Terra cotta Warrior Collectible Statuette Small 6"